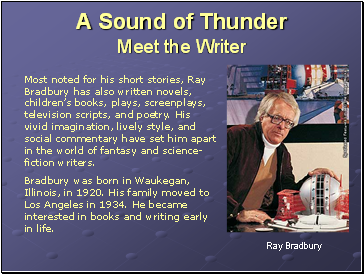 Most noted for his short stories, Ray Bradbury has also written novels, children’s books, plays, screenplays, television scripts, and poetry. His vivid imagination, lively style, and social commentary have set him apart in the world of fantasy and science-fiction writers. 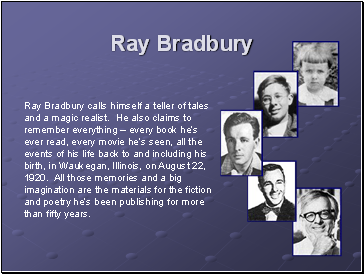 Bradbury was born in Waukegan, Illinois, in 1920. His family moved to Los Angeles in 1934. He became interested in books and writing early in life. 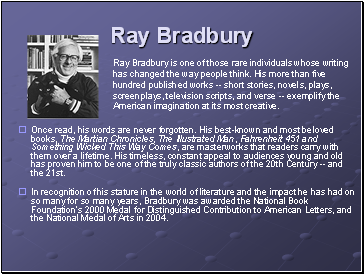 In recognition of his stature in the world of literature and the impact he has had on so many for so many years, Bradbury was awarded the National Book Foundation's 2000 Medal for Distinguished Contribution to American Letters, and the National Medal of Arts in 2004. 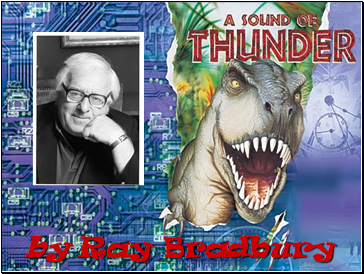 Ray Bradbury calls himself a teller of tales and a magic realist. He also claims to remember everything – every book he’s ever read, every movie he’s seen, all the events of his life back to and including his birth, in Waukegan, Illinois, on August 22, 1920. All those memories and a big imagination are the materials for the fiction and poetry he’s been publishing for more than fifty years. 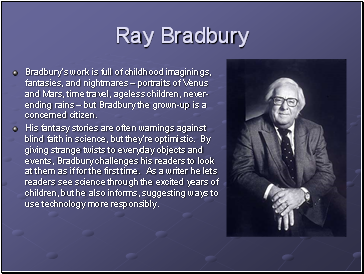 Bradbury’s work is full of childhood imaginings, fantasies, and nightmares – portraits of Venus and Mars, time travel, ageless children, never-ending rains – but Bradbury the grown-up is a concerned citizen. His fantasy stories are often warnings against blind faith in science, but they’re optimistic. By giving strange twists to everyday objects and events, Bradbury challenges his readers to look at them as if for the first time. As a writer he lets readers see science through the excited years of children, but he also informs, suggesting ways to use technology more responsibly.